The thyroid gland is located at the top of the neck. It produces several hormones that are for us in terms of our goals (get rid of fat) points. First isolated hormone produced by the thyroid hormone T4 was. It was initially considered a major thyroid hormone, but later revealed that it is more of a prohormone, because so far not revealed any of its direct action in the body. Its activity is indirect, as well as a source for creating the active hormone T3. Part T3 (about 20%) comes directly from the thyroid gland, the residue produced by the conversion of T4 to T3 in the liver, kidney, muscle and central nervous system. Not all of the T4 is converted to T3. T4 is a reservoir of inactive thyroid hormone in the blood. The level of hormones T4 and T3 is controlled by feedback mechanism through hormone TSH. If the level of T4 and T3 increased, TSH level falls, thereby reducing the formation of hormones on the other hand, if the level is low, increase the TSH, leading to increased production of the thyroid gland. TSH acts on the size of the thyroid gland. Low TSH is its reduction. T3 is the determining factor for basal metabolism. What does this mean? The more T3 - the more calories the body burns. The energy thus incurred shall be eliminated from the body in the form of heat. T3 thus accelerates the metabolism, that is, the use of protein, carbohydrate and fat in the body. This means that also supports conversion of ingested protein on muscle mass. Moreover, increasing the number of beta receptors in fat and muscle cells. It is these receptors are crucial in lipolysis - the breakdown of fat in fat cells and recruited muscle in muscle cells. Thyroid hormones are anabolic and catabolic. At normal levels are mainly anabolic, but the more increases the level, the more catabolic happen. The most commonly used drug among us from Genesis (quality depends on the source! ), A synthetic hormone T3. Sold in tablet form. The dosage should not exceed 100 mcg daily. The duration of the cycle of 4-6 weeks. The time intervals between cycles least 6-8 weeks. In the next cycle, the dose can be increased, but the beginning of this would be enough. Since T3 increases the number of beta receptors, it is used very often with clenbuterol, which of these receptors directly affected. T3 very good shot while using steroid as PRIMOBOLAN (Pill PRIMOBOLAN), Winstrol (stanozolol tablet form), or OXANDROLONE PROVIRON. T3 promotes anabolic steroids info, and these prevent the catabolism of T3 due to elevated levels. 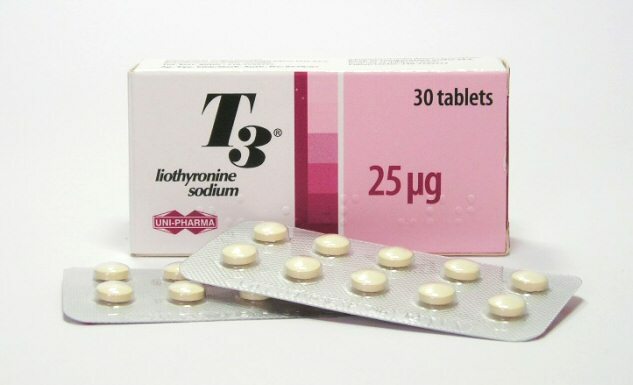 For the greatest risk is considered reducing thyroid due to low blood TSH when using T3. With prolonged use, the risk of permanent loss of function of the thyroid gland. This means that on stopping T3 has thyroid is unable to produce T4 and T3. For this reason it is recommended to take T3 longer than 4-6 weeks and the maximum dose is about 100 to 150mcg. Moreover, it is necessary to complete the cycle of gradual dose reduction. These procedures are very individual. Some users report that they had no problems at doses of 300 mcg per day, and more and abrupt withdrawal cycle without tapering. The duration of use within 6 weeks, the majority of resources matched. The most common side effects include increased heart rate, irregular heart rhythm, sweating, headache, digestive problems. T3 is one of the most effective agents in the fight against fat. Dare to say that it is safe and when I come across a case that actually occurred in permanent damage to the thyroid gland. The risks are clear, there are, however, in my opinion, can be minimized by limiting the reasonable dosage and cycle length.